My adorable baby niece Isabella will turn 2 on September 14 so here's wishing her a wonderful birthday and may she grow up to be a beautiful loving girl! I hope she knows just how much I miss her and I'm looking forward to holding her in my arms again. She's only two but she's done a lot of travelling already. When she was barely 3 months old, she took her first ever plane trip to UK together with her mommy and dad. They've been there for two years now but since then, she's also been back to Malaysia twice and they recently went to Havana to visit the in-laws. That's a lot of travelling for a baby! When Baby Issy was still really tiny, my sister had to carry around this cool eddie bauer infant travel bed for her whenever they travel. This infant travel bed boasts a collapsible frame, making it handy and great to have on board an extended travel. 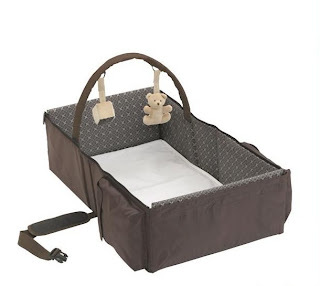 It is also lightweight so it's most ideal for your baby to enjoy a comfortable restful nap while travelling. Changing your baby here is equally easy and you can make use of the large storage pockets to hold all the essentials your baby needs while travelling. Fitted sheet and soft toys are included to ensure your baby remains entertained and happy until you reach your destination. Now that Baby Issy is two, she doesn't use her travel bed anymore but it definitely served her needs when she was a baby. Have a safe flight home baby doll; I can't wait to kiss you! 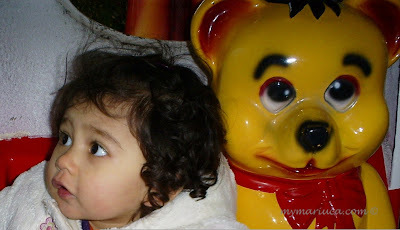 Ohh.. sweet adorable Issy is turning two already?? OMG I still remember reading your post about your sister giving birth and her baby picture in the hospital.. where did the time go?? Awww, what a cutie pie! Happy Birthday, Baby Issy!! More photos please, Auntie Mariuca! me too dropping ec now!! don know how many more to go lol!!! I’m dropping for MPG… can’t wait to finish…. Awwww...Happy Birthday baby Issy!! She is so adorable Marzie!! Marzie we are preparing to leave and won;t be back until Sunday. LJ had to reset my monthly talker as it was done correctly before she did my make over. So I can't do a monthly reward for top talkers for August. But, I am here to congratulate you for being all time Top Talker. I will be sending you 1000 EC's right away. Ayie!! Maybe u can have a post on possible baby names for ur baby and get ur readers to suggest!! Woo hoo, that will be fun eh? :) I’m sure hubby will join in the fun when your due date is nearer, he will be super excited by then! Oh thanks sweetie, baby Issy does have lovely features, love her! Have u emailed me Ayie?? ?